I'm writing to you in my dreams because in the daytime I can't talk. I know how much you love words and it makes me sad that I can't give them to you. I think in words and in pictures but when it gets time for the words to come out of my mouth they get stuck. I know so much Mom. So many words and thoughts and concepts and ideas. I wish you knew I knew. They try to teach me numbers. They have me count to ten. I can actually count into the thousands, but only inside my head. I just can't tell you or show you. I know we have 229 tiles in our front entry way. I know we have 54 windows and 17 doors in our house. I know hundreds of different colors. That's why I get so frustrated and bored during therapy sometimes, I already know all those things... I just can't tell you. I know I have autism and I know sometimes that makes you sad. Although I don't look in your eyes much, I know everything about you. I've memorized your face a thousand times before. I feel and see things in a way I don't think you can if you don't have autism. I think feeling is part of my Super Powers that you mention. I know when you are happy or sad or scared or angry. I can feel your energy. I remember you used to get so scared every time I lined up my cars or flapped my hands, and one day I could feel you just weren't scared anymore. Sometimes you line up cars with me now and flap your hands too. It makes me so happy to see that you finally realize how good it feels. Sometimes I get sad. I communicate but not with words. When I tell you things in my way you don't understand and I get mad. I wish I could tell you things in a way you could understand. I know you feel so much too, Mom. We are the same that way - but my ability to feel is like yours times a million. I feel lights and sounds and energy and smells and touch. Sometimes so strongly it's unbearable. Sometimes things feel so loud that I scream to make it more quiet in my head. You think my screaming is loud but it's nothing compared to what I can hear with my ears. Sometimes I feel so much that I feel like crawling out of my skin. I feel intensely. So intense it sometimes flies off my finger tips while I'm shaking my hands. I want you to know I'm happy, Mom. My mind has never worked any other way, I don't know any differently. Although my happy doesn't look like yours, I am happy. I don't need the things you do to be happy, like words and eye contact and kisses and new clothes and hard wood floors. I need so much less. My cars make me happy. The pool makes me happy. No clothes makes me happy. Dad makes me happy and feel so safe. He spins me and gives me squeezes and he loves me more than he's ever loved anyone in his whole life, besides you and Parker. My autism broke his heart wide open, Mom. See, it isn't all bad. I hear you talk. Even when you think I am deep inside my head, I hear you. I am with you. Sometimes when you are rocking me you say, Greyson, I love you so much. I know you are in there. I'll never give up on you. And you put your hand on my chest and you feel my heart beat and you cry, because you are afraid I don't know that you love me. I want you to know Mom- I know. I felt it from before I was even born. I feel it every day in every touch, so much love it's almost unbearable - to feel that much love. I'm sorry I don't play little league or want you to read me bedtime stories or call you Mom out loud. I'm sorry that sometimes things are hard for both of us. I'm sorry I'll probably never get married or become a lawyer or give you grandchildren. I'm not on earth to do any of those things though, so it's okay. Life would be so boring if we all did the exact same thing. I hope you feel happy with however I turn out to be. I'm here to change the world. You are helping me, and that makes me so happy that I just want to flap my hands. I think people should love the gifts and lives they've been given and not feel sad about them too much if they can help it. I think we all have the exact Life we are supposed to, and it's up to us to find the beauty and lessons inside. People think kids with Super Powers have a lot to learn- I say typical people are the ones with a lot to learn. Like looking on the inside and loving what is- instead of being afraid of what isn't. There's a lot to be said about loving just a few uncomplicated things in life... like the beach, or plants or water or spinning. Mom, I want you to know I love you too. I'm sorry I can't tell you in words, but I do tell you all the time in the ways that I can. I know you can feel it. Love that big can't be hidden or unfelt. Mom- will you tell all the other Moms of kids with Super Powers that this letter could have easily been written by their baby too? Keep writing to make the world a sweeter, kinder, more aware place. I think it's part of the reason why we are both here on Earth. Most of all, When it comes to me, always believe that absolutley anything is possible. Like Life with Greyson + Parker on FACEBOOK, and please help us share these words with the WORLD. Wow. I'm not a crier, but I felt that. I worry all the time that my kids don't know how loved they are. And I know they don't mean it when they yell at me or tell me that I am mean for something like asking them to put their shoes on. But inside I worry. What a beautiful letter. I believe every word is true. Thank you, Thank you Thank you Chrissy for your words. PERFECT (is the only one word that comes to mind). You are changing this world more that you know! You bring such joy and hope to moms (like me) with a child on the Autism Spectrum. 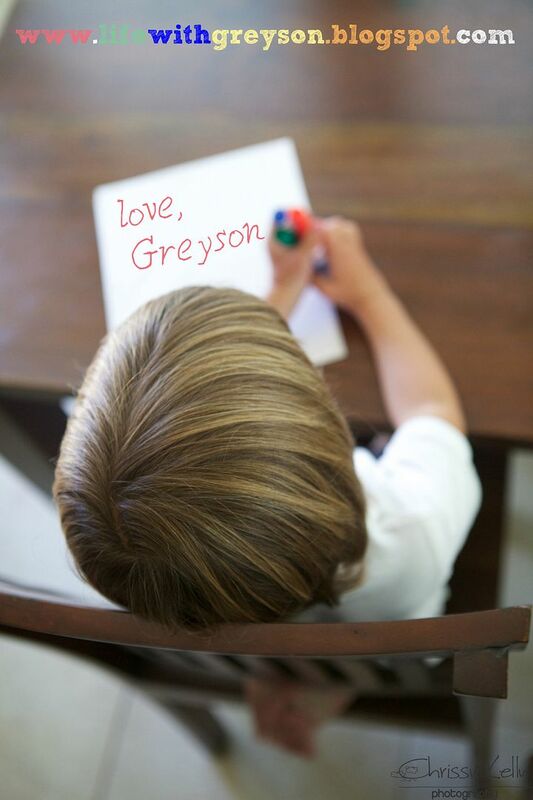 I felt every bit of that "letter from Greyson" as if it were from my own Brady! I have and do feel and think all those very same things. It feels so good to know I am not alone with those same feelings (as I sit here sobbing and reading :) It hurts so much sometimes. But then I remember, I wouldn't give all my cards back to God and draw again. (Not in a million years) I am sharing your blog and have had so many friends reply back to me that they love it, and they are also sharing it with a relative who has a child on the spectrum. 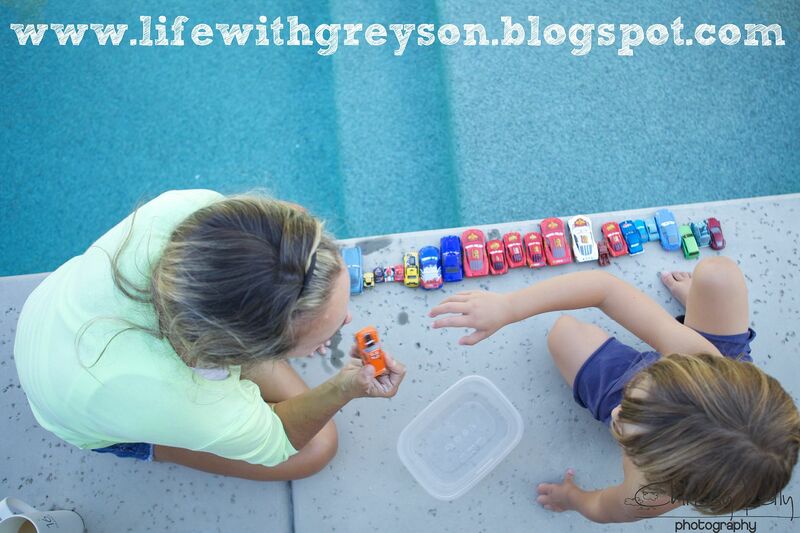 You make a difference...and Greyson and Parker are helping you do it! I needed a good cry tonight! It feels good sometimes to just let go. Thank you my friend! Beautiful Crissy! Brought a tear to my eye as I "heard" my 2 year old son with asd speak through Grey's letter. Thank you! Thank you! As I sit in speech therapy with my two year old with autism today praying for that one word to cross his lips, I will remember this letter. Reading your blog is one of the first things I do each morning, coffee in hand. So quite often, I sit here sipping away, tears making their way down my face. I love your fresh and honest look into life from different view points of autism. God Bless. What great work you are doing. Keep it up kid! Chrissy!! I'm in tears at 7:30am! I love your blog! 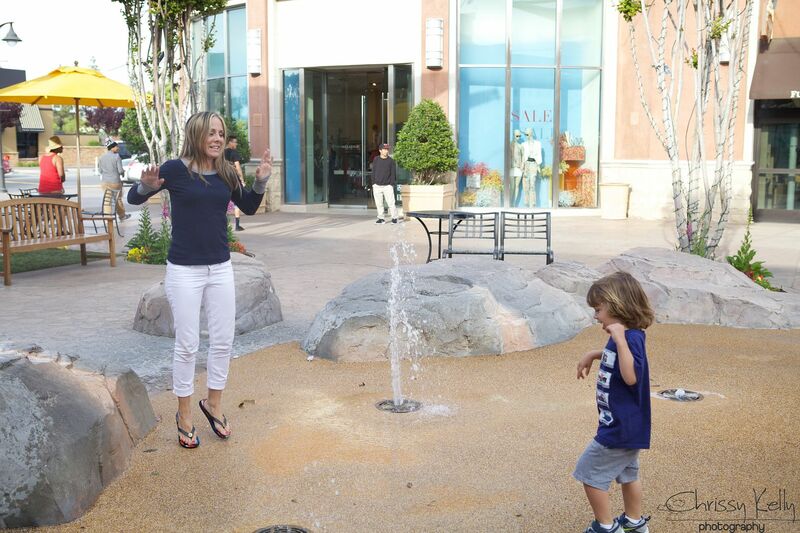 You are such an amazing mommy, writer and advocate for your little ones. Wow! Chrissy, that really had my heart overflowing and spilling out onto my cheeks. I think my favorite was "I'm not on earth to do any of those things though, so it's okay." Sorry, attempted to edit last comment, wasn't planning on deleting it! That was absolutely beautifully written. Thank you so much, it touched me deeply today. oh.my.goodness. I love you! You are so wise beyond your years, girl. God is doing some amazing things with you. Keep being wonderful and discovering all truth and beauty you can. I could just die at the pictures of you flapping your hands and lining up cars-true love at it's best! This was utterly gorgeous. I'm sharing it on Facebook. What beautiful, powerful and profound words... You are a gem and we are so blessed that you are sharing your gift of writing with us. Thank you! Thank you! Thank you! thank you for your transparency and courage to share - your post blessed me immensely and helped me today specifically with my child - an absolute answer to prayer. The part about typical kids learning? Mama my heart breaks open a little more each time I read your words. You are an amazing mama. You, Parker, Greyson and Michael are lucky to have each other. Big love. Thank you! My son has Down Syndrome & Autism and is non-verbal! This letter touched me in ways you know!!! Thank you from the bottom of my heart! Thank you for sharing. I love the part about we all have something different to do here. He is a remarkable little boy with a even more remarkable mom. Holy cow girl! That was utterly incredible! Crissy - that was so beautiful - made me cry! I love this letter. Thank you for sharing! My son just turned 6years, he have mild autism and adhd and this letter tells me all my son does and feel!